Located just off the casino floor in Encore, Wynn’s latest signature resort, lies a fun and fanciful restaurant that’s open all day and into the evening so that you can experience its whimsical food whenever those hunger pangs hit (well, almost whenever; Chef Canteenwalla has to sleep sometime, you know!). Called Café Society Encore, it’s marked by an oval sign brightly displaying its name off the casino floor. To get inside, step away from the tables and onto the gently sloping black and white marble floor, which takes you through an entryway that’s enhanced on either side by fanciful metallic floral sculptures as well as real flowers with palms. You’ll immediately feel the magic. If you need a little help getting inside, there are curved, chocolate-colored wooden banisters on which you can support yourself while you’re climbing the very gently sloped floor. A fanciful green, white and gold hexagonal chandelier is suspended by a chain from the ceiling above while potted palms surround a hostess station below. Located at the back of the entryway, this hostess station has a glass and wood screen behind it that separates it from the dining room. As you are walking up to the station you can gaze to your right and see the outer dining area or to the left and view the restaurant’s new bar area. Society Café Encore evokes thoughts of whimsy and fun, offering an unbuttoned dining experience that ironically was modeled after the buttoned-up days of Oscar Wilde and Victorian England. The first dining room that you’ll see when you enter, the outer dining area, is toward the right and is decorated with mirrors that give it a complete view of the casino. If you really want to be close to the action, you can eat at one of two tables that directly overlook the casino. Wherever you sit, the focal point of the room is a large fucshia leather banquette with velvet arms and black and cream accent pillows that spans the entire room and acts as a partial divider between the middle dining room and the outer dining room. Directly opposite the open wall to the casino, it’s surrounded by two arches that contain black, white and green pulled draperies that are held back by green tassels with cherrywood bulbs. 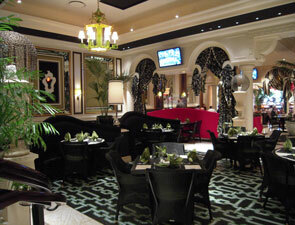 If you are looking directly at the room from the casino, the banquette is at the far end of the room. A large mirror, meanwhile, is on the right wall, right behind a small service station. 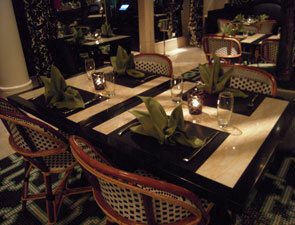 Toward the left are the aforementioned flowers and palms that separate the room from the entryway and underfoot is a black rug with green and fuchsia patterns that cover the creamy marble floors. Finally, spotlighting illuminates the room along with a fanciful green and gold chandelier featuring six covered lights that add atmosphere as well as light! If you don’t care to sit on the banquette, there’s plenty of other seating available, including black crocodile leather seating that’s framed in dark brown wood, providing a uniquely comfortable dining experience!